Are You and Your Pets Ready in an Emergency? 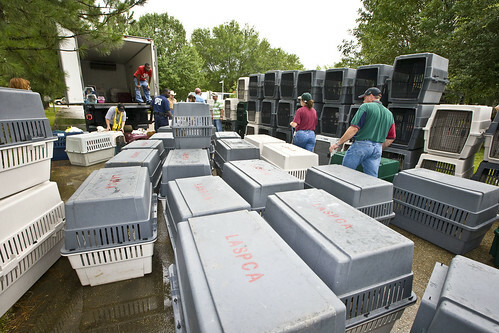 Employees with USDA’s Animal and Plant Health Inspection Service’s Animal Care program work with State and Federal partners on an Animal Care Emergency Exercise in Baton Rouge, LA. We are reminded often throughout the year of the devastating impacts that families and their communities experience when natural disasters such as, floods, mudslides, tornadoes, wildfires, earthquakes and hurricanes strike. Because September is National Preparedness Month, it is a good time to think about emergency planning. Don’t Wait. Communicate. Make an Emergency Communication Plan. There is a lot of information out there on what to do in the event of a natural disaster, and how to prepare in advance for an emergency – what to bring, what to have in your vehicle and so on. But what about your pets, do you have an emergency kit ready for them? Many of us consider our pets family members. In an emergency, it’s important to make sure all family members have what they need to travel safely and for their interim care. No matter what type of emergency, there is one key question you’ll need to answer: Is it safer to stay where you are and “shelter-in-place,” or will you need to evacuate to keep your family safe? If you leave, always take your pets with you. Even if you expect to be gone for just a few hours, the situation could change dramatically. After all, it’s a disaster. Remember this important rule – if it’s not safe for you, it’s not safe for your pets! Here are some tips that will make evacuating with your pet easier. Know a safe place to take your pet. Pick several locations (one in your community, and at least one outside of your area in case your whole community is affected by the disaster). Identify locations (friends/family or pet-friendly hotels/motels) in advance. As a fallback plan, have a list of boarding facilities or veterinarians that are able to take your pet in emergency situations. Make sure your list includes addresses and phone numbers. Have a list of pet shelters that may provide shelter or fosters for pets in emergency situations. Make sure your list includes addresses and phone numbers. Make sure your pet has a collar and tag with current contact information. If possible, microchip your pet, and make sure the chip is registered and your contact information is up-to-date. If at all possible, bring a pet carrier for each pet. Emergencies are stressful for everyone, including your pet. Preparing in advance can make emergencies less stressful for everyone. Learn about the most common types of disasters in your community at http://www.flash.org/perils.php. Ask your local emergency management office for up-to-date information for pet owners and pets in your area. You can find general information on how to prepare yourself and your pet for an emergency on FEMA’s Ready.gov website: https://www.ready.gov/animals or download the FEMA App to keep you informed and prepared where you live, work, and travel. BRING BACK THE ANIMAL BREEDER DATA! Tell me where to go to give my support! @Frank J Jones - thank you for your comment Frank. The review of APHIS’ website has been ongoing, and the agency is striving to balance the need for transparency with rules protecting individual privacy. APHIS is currently involved in litigation concerning, among other issues, information posted on the agency’s website. While the agency is vigorously defending against this litigation, in an abundance of caution, the agency is taking additional measures to protect individual privacy. These decisions are not final. Adjustments may be made regarding information appropriate for release and posting. Pls explain why information on young animals, namely puppies, kittens, and horses being sold from what is known as Puppy Mills was removed from the USDA site. Information from seven states was listed to aide us in avoiding the support of these despicable businesses. the question should not be why you took down the information from the businesses in these states but why you are not including businesses from all states. It's truly despicable that you removed this information.